Flip open the slender leather-bound volume on the bar at Monk’s Kettle and you’re liable to find yourself awash in beers — but if you’re like me and you haven’t been swept up by the IPA craze and aren’t sure what a Trappist is, never fear. Monk’s Kettle set out a decade ago to become a neighborhood tavern and, for the past week, it has been in the midst of celebrating 10 years of successfully accommodating eager drinkers interested in learning about the possibilities of beer. 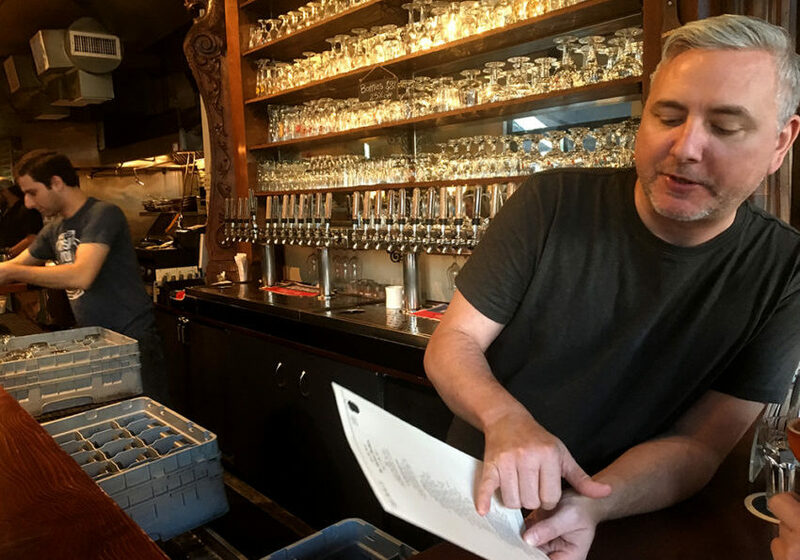 Unlike most neighborhood joints, this one has a cellar stocked with “whales” (a beer-nerd reference to rare varieties), a staff with Cicerones (the beer equivalent of a sommelier) and that aforementioned weighty beer list. Christian Albertson, who owns Monk’s Kettle, saw an opportunity when he arrived from Boston to open a place that serves good beer when “beer culture” wasn’t really a crowded field in San Francisco. Ever the cheap boozehound, I asked: What’s a good beer? “The one that you like,” was the simple reply. “Our job is to find the best beer for the person in front of us,” Albertson added. The concept of Monk’s Kettle hasn’t changed. Come in, sit down, say hello. Have a beer. If you don’t know what you like, ask — the staff is at the ready to educate or simply serve and retreat, to your preference. 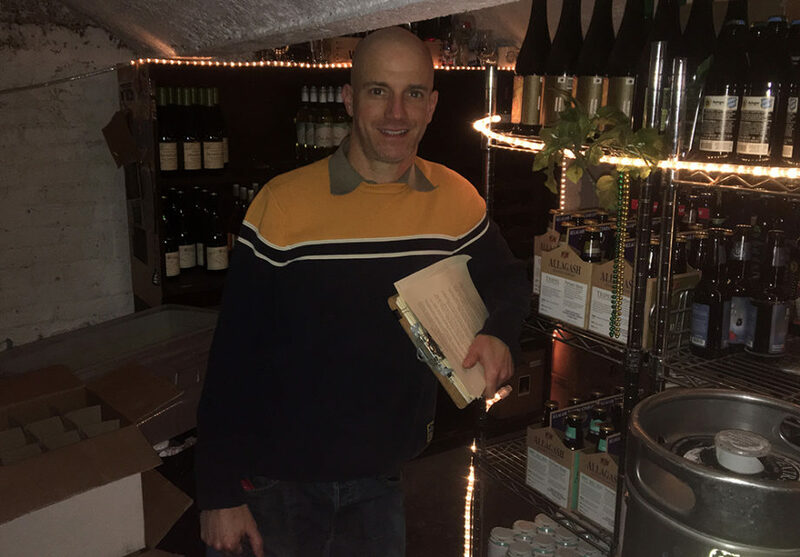 Owner Christian Albertson in the cellar of Monk’s Kettle. The specifics, however are in constant flux. Albertson rotates the menus just about every week, so what’s available changes a dizzying 50 times a year. The clientele, too, has shifted, and Albertson is staying on his toes: The restaurant and industry workers who once lived in the Mission and came to the tavern in two waves at the beginning and end of the evening have drained away, so the late-night hours are now limited to the weekend. But even with the newcomers who have flooded the city, consumers haven’t managed to develop a taste for posh. They want something good, but they want a deal. So Albertson lowered the prices and added to the menu. “People want burgers, and we don’t have to outpunch our class,” he observed. At the same time, the spread of beer culture has meant that good beer can be had in many more places. “Beer culture” is a bit like “wine culture,” except perhaps slightly younger, slightly more male, and less expensive. But as more brewers arrive, more varieties of businesses are selling more kinds of craft beer, and rare bottles are becoming less so. Aficionados have developed a habit of picking up a few bottles of something interesting to take home, share and Instagram. “The biggest thing is how much good beer is around,” Albertson said. People know the names of beers now. IPAs (bitter and hops-strong) are widely adored, but people now also ask for sour beers (more tart than sour, really) or a saison (sparkly and fruity). Beer culture, in its different interpretations, has grown so much that Monk’s Kettle can do a whole 10 days of tribute to various methods and makers from the ancient and distant to the modern and local, and attract aficionados who form a line outside of its location at 16th and Albion. This advent culminates in an event on the actual to-the-day 10-year anniversary — Monday, Dec. 18 — that will showcase beers from five bay area brewers and a “kick the kegs” party. “We wanted to pay homage to showcase what we do well,” Albertson said. Albertson, 43, is married and has children now, and a few years back left the city to move to Marin with his family after the building where they lived in San Francisco was sold. He’s worked in the restaurant industry in some capacity since high school. 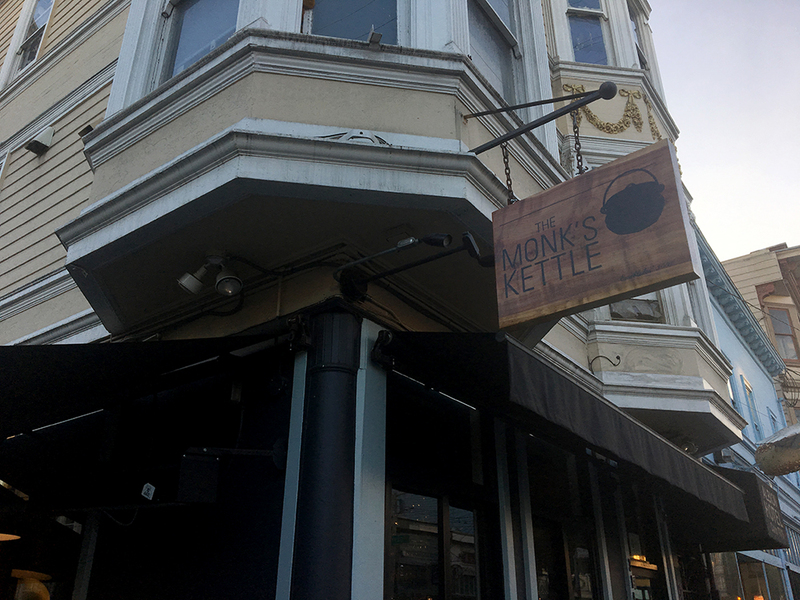 On Monday, with ten years of Monk’s Kettle under his belt, he’ll throw two parties, one of them already sold out, to celebrate a restaurant that constantly has lines out the door. So the real question is, how to get a seat and a sense of that neighborhood-tavern feel? Go early. Go in the early evening (or even for lunch — perhaps the tavern’s best-kept secret is that it has been open for lunch every day for 10 years). I’m really surprised you guys aren’t spinning them as agents of gentrification. How many community members can afford $11 snifters of beer?